The strike water we transferred over to the Mash/Lauter Tun will have lost some heat as the kettle was cold. Before mashing in (adding the grain), we should let the water recirculate through the HERMS coil for 5-10 minutes to get back up to the mash temperature. CLOSE all valves. Connect hoses as shown in the picture below. OPEN all Mash/Lauter Tun valves, Hot Liquor Tank valves, and both pump valves. (Opening the Mash/Lauter Tun OUT valve last can help if you have pump priming issues). Turn the WATER PUMP and WORT PUMP switches ON. Turn the ELEMENT SELECT switch to HLT. The water in the Mash/Lauter Tun will recirculate in the HERMS coil and the temperature will return to our 149F mash temperature. Keep the Mash/Lauter Tun and Hot Liquor tank lids on throughout the process to minimize heat loss. If brewing indoors you may want to run your hood fan at low speed to exhaust any excess heat. Once both the Hot Liquor Tank and Mash/Lauter Tun PIDs read 149F (our mash temperature), it's time to add the 18 pounds of grain. Turn the WORT PUMP switch OFF to stop recirculation through the Mash/Lauter Tun. Leave the WATER PUMP running in order to maintain the water in the Hot Liquor Tank at 149F mash temperature. Gently scoop the milled grain into the Mash/Lauter Tun. A small bowl works well. If using mash salts add them at this time as well. Stir for a few minutes with the mash paddle to ensure that all of the grain is wet and there are no clumps or dry pockets (called 'doughballs'). Stirring should be done gently without any splashing to minimize oxygen uptake (hot side aeration) which some say may lead to off-flavours (though this is a highly debated topic). Once well mixed and left for at least 10 minutes, take a pH reading by placing the probe tip of the pH meter directly in the mash. The pH meter we recommend has automatic temperature compensation (ATC) up to 140F so we do not worry about cooling down a sample as any errors introduced will be minimal as we usually measure the mash pH when the temperature is just slightly above 140F. While the probe electrode will last longer if the sample is first cooled to room temperature, ours (so far) has last 10 years when brewing once or twice a month, so we've never bothered cooling down a sample as it's much quicker. Feel free to cool a sample to room temperature if you prefer. pH is affected by the grain we use (darker grains lower pH more than lighter ones), any brewing salts we add (some salts increase pH, some reduce pH), and by temperature. For optimal starch to sugar conversion we want the pH to be around 5.2 to 5.4, but only when measured in the mash temperature range of somewhere around 145-165F. pH changes with temperature, so if the sample has been cooled to room temperature, a pH of 5.4 to 5.6 is the target range instead of 5.2 to 5.4. Don't confuse the inclusion of automatic temperature compensation (ATC) in the pH meter to mean that the target range will always be 5.2 to 5.4 regardless of temperature, as that would be incorrect. ATC only compensates for the change in the electrical response of the pH meter probe with temperature. It does not compensate for the chemical/energy change in the water that naturally makes a hotter mash more acidic (lower pH). The pH target range will therefore always depend on the temperature of the sample: 5.2 to 5.4 when measured at mash temperature, or 5.4 to 5.6 when measured at room temperature. For this reason, throughout these instructions whenever we mention a target pH range we will always indicate whether this is for a sample measured at mash temperature (approximately 145-165F) or measured at room temperature (approximately 60-80F). Most publications we've come across fail to provide this extra temperature information when discussing pH, making pH a very confusing subject. Without temperature information, comparing pH values with other brewers becomes a futile exercise. It would seem that you should be able to assume that, for example, whenever a mash pH value is given that it always means that the pH was measured at mash temperature but unfortunately that is not the case. Historically a brewery would send a sample of their wort to their in-house laboratory for a pH measurement, so targets were usually in the 5.4 to 5.6 range (measured at room temperature) as the sample will have cooled off by the time the reading was taken. 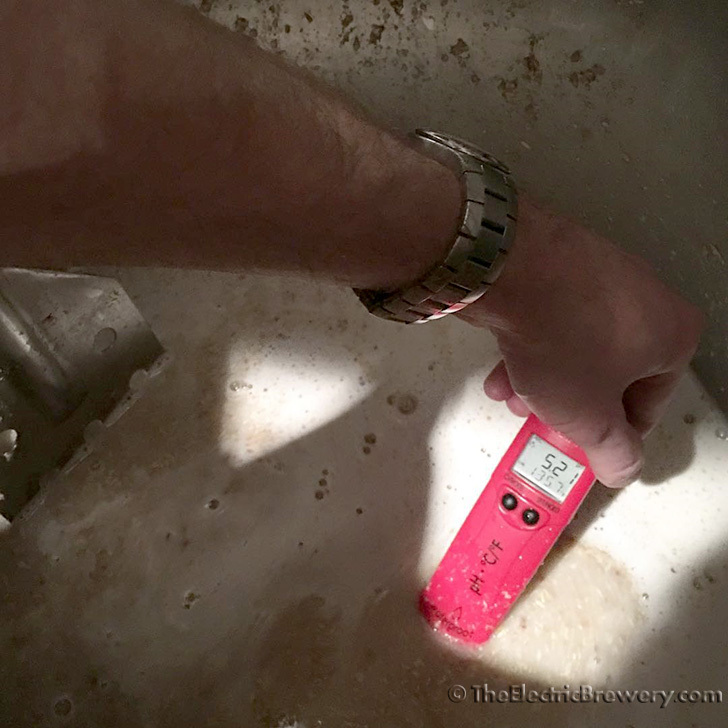 It is only more recently that breweries have started to use inline testing at warmer mash temperatures such that the target is in the 5.2 to 5.4 range. Regardless of range, there is no 'one' correct mash pH as the various enzymes work best at different pH levels when converting the grain starches to sugars. While a wide range (from 4.5 to 5.6) is acceptable for mashing, most brewers will try and stay somewhere in the 5.2 to 5.4 range (when measured at mash temperature). 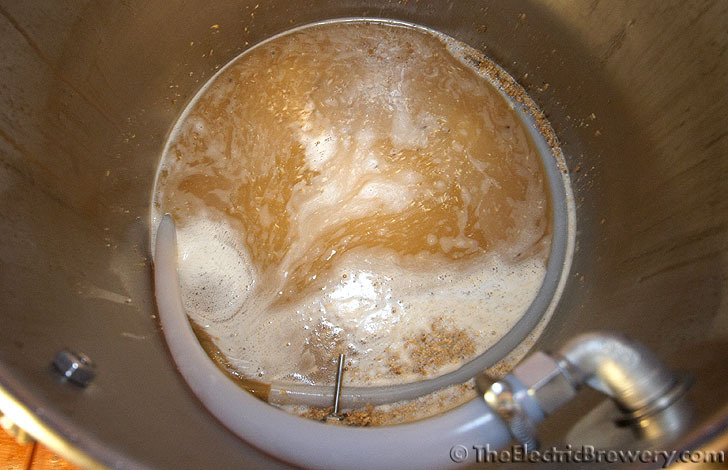 A higher pH (more basic) produces a sweeter beer due to a less fermentable wort and more body. A lower pH (more acidic) produces a drier beer with thinner body due to a more fermentable wort. It also produces better extraction efficiency, better hot break formation, lighter colour, and is less prone to form haze. The most common problem brewers face with a light coloured beer such as our Blonde Ale is that the mash pH will be too high. If your pH is above the 5.2 to 5.4 range (when measured at mash temperature), add some 88% lactic acid half a milliliter (mL) at a time using a 1mL (1 cc) syringe, stir well and wait for at least 5-10 minutes, and re-measure until you get close close to 5.2 (when measured at mash temperature). It usually only takes one or two milliliters at most for a mash this size. At these low amounts (0.1-0.2 mL per gallon), lactic acid will not affect the taste of even the lightest of beers. Mash pH at 5.21 after adding mash salts and a bit of 88% lactic acid. Perfect! Place the hose back in the kettle on top of the grain bed as shown in the picture below. The hose may sink in a bit or be mostly submerged. This is normal. Place the lid back on the Mash/Lauter Tun. Both of the Mash/Lauter Tun valves and the WORT PUMP valve should still be completely open. Turn the WORT PUMP switch ON to start recirculating the mash through the HERMS coil. While most of the starch to sugar conversion will take place in the first 30-60 minutes, we will mash for 90 minutes to maximize conversion as the mash temperature is low (conversion takes longer at lower temperatures). Some very high gravity beers (such as a strong barleywine) can even benefit from a 120 minute or longer mash. Press the 4/3/2/1 buttons on the Timer until the lower number reads "90:00". Press the RESET button to start the timer. The top number on the Timer will count down from 90:00 to zero to let us know how the mash is proceeding. 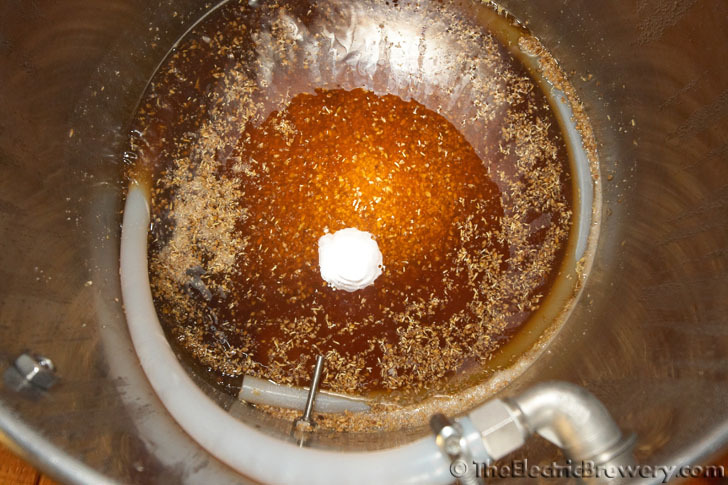 The continuous recirculation filters the wort naturally using the husks in the grain bed (a process called 'vorlauf'). The wort slowly clears over time as the grain is mashed. Do not stir by hand or use any mechanical stirring devices from this point forward as this is counter productive and destroys this natural grain filter. After the grain is initially mixed with the strike water, it should never be disturbed again. OPTIONAL ALARM: To be notified when the 90 minute mash is finished, turn the Timer ALARM switch ON. Once the alarm sounds turn the Timer alarm switch OFF or press the RESET button. The initial mash temperature will be a few degrees below our target as the grain was cold. After a few minutes of recirculation the mash temperature will have risen back up to 149F. Having the mash a few degrees below the target mash temperature for a few minutes will not have a noticeable effect on the starch to sugar conversion. 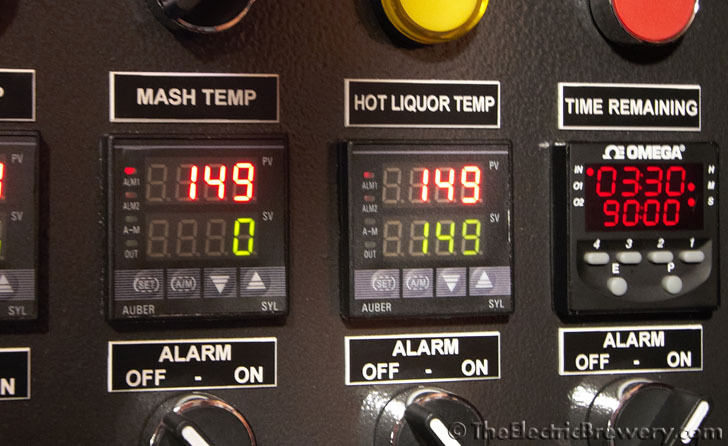 Some users may choose to set their Hot Liquor Tank a few degrees higher (such as 154F) when heating their strike water, and then lower the temperature to 149F after mashing in. This would reduce the ramp-up time but we don't bother as it does not have any adverse effects. The beer is not dryer than we expect (a lower mash temperature produces more fermentables which results in a dryer beer). 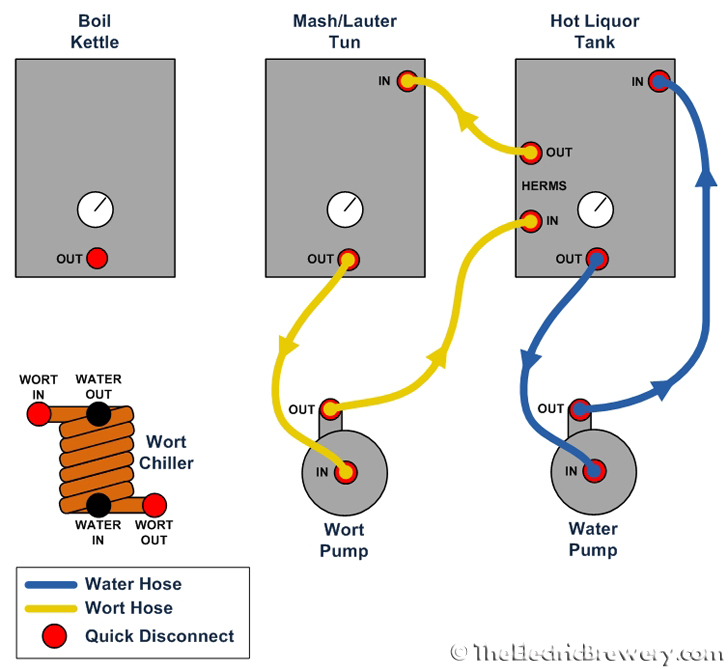 On brewing setups that do not use our recommended parts, the mash temperature may never quite reach the Hot Liquor Tank temperature due to heat loss in the Mash/Lauter Tun, hoses, and pumps. To compensate you may set the Hot Liquor Tank temperature a degree or two higher. The mash in this example is called a 'single-infusion' mash as a single temperature (149F) is used throughout the 90 minute mash period. 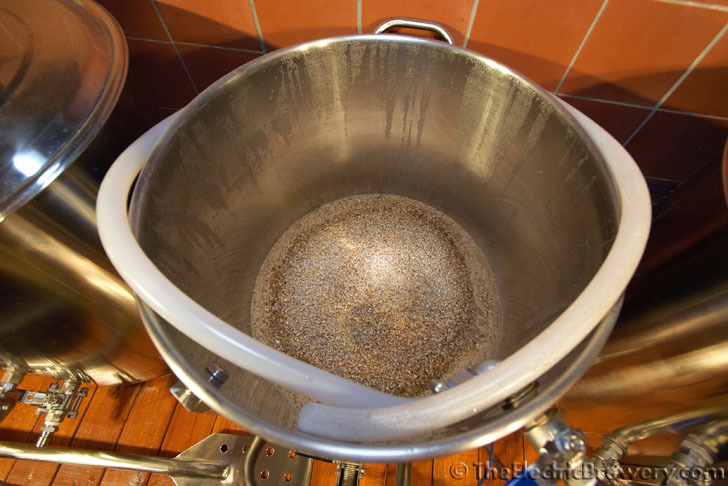 It is the simplest and by far the most common method used by home brewers and craft brewers as today's modern malts are already well modified. A well-modified malt has already undergone a lot of process steps that involve different temperatures before it arrives in your hands. The home brewer only needs to mash at a single temperature for efficient starch to sugar conversion. Historically, when under-modified malts were more common, some of these steps had to be done by the brewer by mashing at multiple temperatures (called 'step' mashing). For more information on these and other mashing techniques, see Chapter 16 of How To Brew and Chapter 2 of Brewing Better Beer. 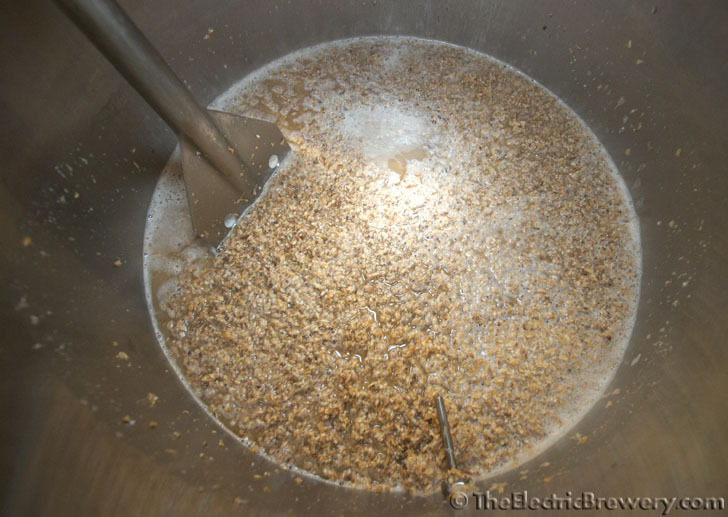 Even with today's highly modified malts there may be times when a brewer wants to step mash. 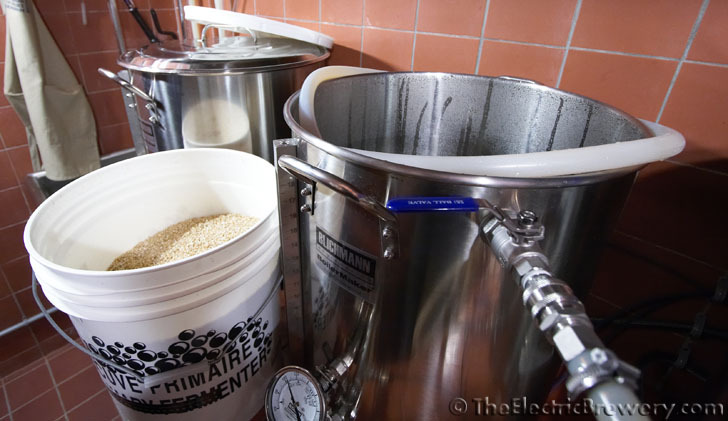 Step mashing is easy with our Electric Brewery setup for those who wish to try it. Simply start at the first temperature and increase as required by using the UP button on the Hot Liquor Tank PID after each rest. 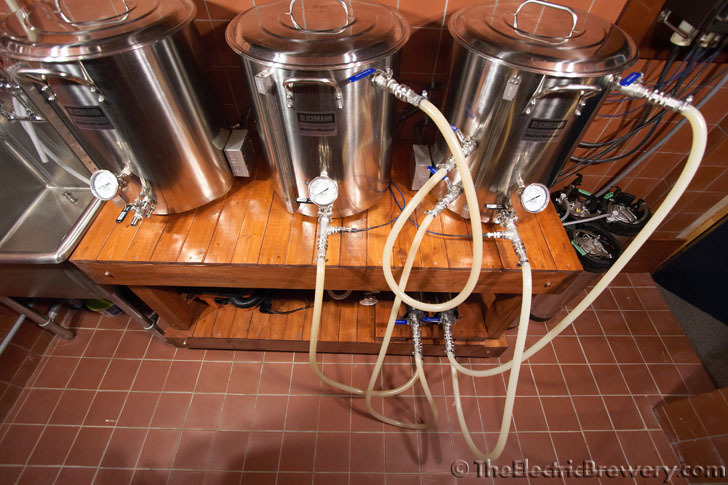 The mash temperature will ramp up at a rate of approximately 2 degrees per minute. Mash temperature is maintained as the liquid is recirculated through the HERMS coil in the Hot Liquor Tank.